For the 1931 incident that led to the Japanese invasion of Manchuria, see Mukden Incident. 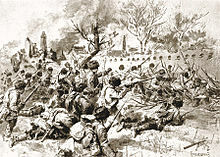 The Battle of Mukden (奉天会戦, Hōten kaisen), one of the largest land battles to be fought before World War I and the last and the most decisive major land battle of the Russo-Japanese War, was fought from 20 February to 10 March 1905 between Japan and Russia near Mukden in Manchuria. The city is now called Shenyang, the capital of Liaoning province in China. The Russian forces, numbering more than 340,000, under General Alexei Nikolajevich Kuropatkin, fought the attacking Imperial Japanese Army forces numbering more than 270,000, led by Marshal Marquess Ōyama Iwao. Involving 610,000 combat participants and 164,000 combatant casualties, it was the largest modern-era battle fought prior to World War I, and possibly the largest battle in world history up to that point. The scale of the battle particularly in the amount of ordnance being expended, was unprecedented in world history. The Japanese side alone fired 20.11 million rifle and machine gun rounds and 279,394 artillery shells in just over ten days of fighting (the Russians fired more), matching the ammunition consumption of the German army in the entire 191-day Franco-Prussian War. Following the Battle of Liaoyang (24 August to 4 September 1904), Russian forces retreated to the river Sha Ho south of Mukden and regrouped. From 5 October 1904 to 17 October 1904, during the Battle of Shaho, the Russians unsuccessfully counter-attacked, but managed to temporarily slow the Japanese advance. A second Russian counter-offensive, the Battle of Sandepu, fought from (25–29 January 1905) was likewise unsuccessful. The fall of Port Arthur to General Nogi freed up the Japanese 3rd Army, which advanced north to reinforce the Japanese lines near Mukden in preparation for an attack. By February 1905, the manpower reserves of the Japanese army had been drained. With the arrival of General Nogi's Third Army, Japan's entire fighting strength was concentrated at Mukden. The severe casualties, bitter cold climate, and approach of the Russian Baltic Fleet created pressure on Marshal Ōyama to effect the complete destruction of the Russian forces, rather than just another victory from which the Russians could withdraw farther into Manchuria. The Russian line to the south of Mukden was 90 miles (140 km) long, with little depth and with a central reserve. the Second Manchurian Army under General Baron von Kaulbars (who had replaced the unfortunate General Oskar Gripenberg), on the right flank, in flat ground. the Third Manchurian Army under General Baron von Bilderling, in the center, holding the railway and the highway. the First Manchurian Army under General Nikolai Linevich, held the hilly terrain on the east flank. This flank also held two-thirds of the Russian cavalry, under General Paul von Rennenkampf. General Kuropatkin had thus disposed his forces in a purely defensive layout, from which it would be difficult to impossible to execute an offensive without opening a major gap in the lines. the Japanese Second Army (General Oku) advanced to the west. The Japanese Third Army (General Nogi) was kept concealed behind the 2nd Army until the start of battle. A newly formed Japanese Ōryokukō (Yalu River) Army under General Kawamura provided a major diversion on the Russian eastern flank. The Yalu River Army was much under strength, and consisted only of the IJA 11th Division (from Port Arthur) and reservists. Despite that it was technically not under the Japanese Manchurian Army but directly under Imperial General Headquarters to attack Primorsky Krai politically, the division was substantially under Manchuria HQ under the commander's decision. General Kuropatkin was convinced that the main Japanese thrust would come from the mountainous eastern side, as the Japanese had proven themselves effective in such terrain, and the presence of the former 3rd Army veterans from the 11th Division in that area reinforced his convictions. Field Marshal Ōyama's plan was to form his armies into a crescent to encircle Mukden, cutting off the possibility of Russian escape. He was explicit in his orders that combat within the city of Mukden itself was to be avoided. All during the war, the Japanese had pursued a meticulous civil affairs policy aimed at avoiding civilian casualties and keeping the Chinese populace on their side – a stark contrast with the previous First Sino-Japanese War and subsequent Second Sino-Japanese War. The battle opened with the Japanese 5th Army attacking the left flank of the Russian forces on 20 February. On 27 February 1905 the Japanese 4th Army attacked the right flank, while other Japanese forces also attacked the Russian front lines. On the same day, the Japanese 3rd Army began its movement in a wide circle northwest of Mukden. By 1 March 1905, action on the eastern and center fronts was largely static. The Japanese had made small advances but under heavy casualties. However, by 7 March, General Kuropatkin began withdrawing forces from the eastern front to counter the Japanese 3rd Army's moves on the western flank of Mukden, and was so concerned about General Nogi's movements that he decided to lead the counterattack himself. The shifting of forces from east to west was not well coordinated by the Russians, causing the 1st and 3rd Manchurian Armies to all but disintegrate into chaos. Then Kuropatkin decided to withdraw his troops north towards Mukden to face the Japanese forces head-on on the city's southwest and at the banks of the Hun River in the city's southeast. Then Field Marshal Ōyama seized the chance he had been waiting for, and his orders to "attack" were changed to "pursue and destroy". Luck was further with the Japanese due to the late thaw in the weather. The Hun River, guarded by the Russian left flank commanded by Major General Mikhail Alekseyev, remained frozen, and was not an obstacle to the Japanese attack. However, as they crossed the river, the Japanese attack was hampered when they encountered stiff resistance and heavy artillery fire coming from the Russians, now commanded by General Paul von Rennenkampf, resulting in yet more heavy casualties. After heavy fighting the Japanese succeeded in taking the northern bank of the river, causing the Russian defense lines defending the bank to collapse and the far edge of their left flank to be partially cut off from the rest of the main body of Kuropatkin's army. At the same time a salient was formed just 15 kilometers west of Mukden, enabling the Japanese to totally encircle the Russians on their right flank in the process. All but encircled and with no hope for victory, General Kuropatkin gave the order to retreat to the north at 18:45 on 9 March. The Russian withdrawal was complicated by General Nozu's breach through Russian rearlines over the Hun River, and quickly turned into a disorganized rout. The panicked Russian forces abandoned their wounded, weapons and supplies in their flight north towards Tiehling. At 10:00 AM on 10 March, Japanese forces occupied Mukden. After they occupied Mukden the Japanese continued their hard-driven pursuit of the Russians, but this was hampered when Ōyama knew that his army's supply lines were stretching too thin; however, he continued the pursuit of the enemy, though in a lazy, slow manner. The pursuit was stopped 20 kilometers short of Mukden, but the Russians were already fleeing farther north from Tiehling towards the Sino-Russian border at a fast pace, and the battle was over with the Japanese as the victor. Russian casualties amounted to nearly 90,000. The Russians had also lost most of their combat supplies as well as most of their artillery and heavy machine guns. Fearing further Japanese advances, General Kuropatkin ordered that the town of Tieling be put to the torch, and marched his remaining men 10 days further north to a new defense line at Hspingkai (modern Siping, Jilin province, China), where General Mikhail Batyanov (who replaced General von Bilderling as commander of the Third Manchurian Army) organized defenses against a possible renewed Japanese offensive. However, Kuropatkin did not hold this line for very long, and soon organized a complete withdrawal of Russian forces from the region. The Japanese forces suffered 75,000 casualties which included a higher percentage of killed and wounded over the Russians. The Japanese captured 58 artillery pieces. No serious fighting on land occurred after this battle as both Russian and Japanese armies were exhausted from the conflict. 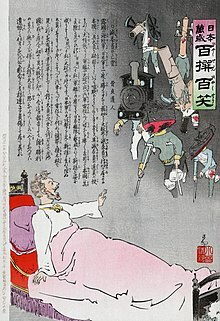 Japanese propaganda from the war: woodcut print showing Tsar Nicholas II waking from a nightmare of the battered and wounded Russian forces returning from battle. Artist Kobayashi Kiyochika, 1904 or 1905. With the defeat of the Russian Manchurian Army in Mukden, the Russian forces were driven out of southern Manchuria for good. However, with problems concerning its overstretched supply lines, the Japanese army failed to destroy the Russian forces stationed in the region completely and Kuropatkin's forces, though severely demoralized, short of supplies and on the verge of disintegration, were still largely intact. But the battle of Mukden was decisive enough to shatter the Russians' morale and, with the unfinished Trans-Siberian railroad now in Japanese hands, undermined the tsarist government's war effort. The final, decisive battle of the war would be eventually fought on the waters of Tsushima. The victory shocked the imperial powers of Europe, as the Japanese proved overwhelming throughout the battle although the Russians had more manpower and material. It showed that European armies were not automatically superior to those of other nations, and could be even decisively outmatched in battle. Tsar Nicholas II was particularly shocked, when the news reached the palace in St. Petersburg, that the relatively tiny Asian empire of Japan, could defeat the powerful and huge Russian empire. The tsarist government was irritated over the incompetence and clumsiness of their commanders during the battle. The generals Aleksandr Samsonov and Paul von Rennenkampf began to loathe each other as Samsonov very publicly accused von Rennenkampf of failing to assist him. In World War I these Generals would command the two armies involved in the even more disastrous Battle of Tannenberg. ^ Tucker 2009, p. 1542: "Thus, the Battle of Mukden is not the decisive victory that the Japanese need." ^ a b Clodfelter 2017, p. 359. ^ Russian Main Military Medical Directorate (Glavnoe Voenno-Sanitarnoe Upravlenie) statistical report. 1914. ^ John Steinberg (editor). "The Russo-Japanese War in Global Perspective: World War Zero." Volume II. Brill Academic Pub: May 2005. Pages 191-192. ^ "Russo-Japanese War, Lessons Not Learned," page 88, by Major James D. Sizemore. The Japanese captured relatively few Russian artillery pieces at Mukden. ^ Tucker 2009, p. 1542. Wikimedia Commons has media related to Battle of Mukden. Palmer, R. R.; Colton, Joel; Kramer, Lloyd (2007). A History of the Modern World (10th ed.). Boston: McGraw-Hill. ISBN 978-0-07-310748-6. Tucker, Spencer (23 December 2009). A Global Chronology of Conflict: From the Ancient World to the Modern Middle East: From the Ancient World to the Modern Middle East. ABC-CLIO. ISBN 978-1-85109-672-5. Retrieved 25 April 2015. Sedwick, F. R. (1909). The Russo-Japanese War. Macmillan. The Battle of the Yalu River lasted from 30 April to 1 May 1904, and was the first major land battle during the Russo-Japanese War. It was fought near Wiju on the lower reaches of the Yalu River, on the border between Korea and China. Count Tamemoto Kuroki GCMG was a Japanese general in the Imperial Japanese Army. He was the head of the Japanese First Army during the Russo-Japanese War; and his forces enjoyed a series of successes during the Manchurian fighting at the Battle of Yalu River, the Battle of Liaoyang, the Battle of Shaho and the Battle of Mukden. The Battle of Liaoyang was the first major land battle of the Russo-Japanese War, on the outskirts of the city of Liaoyang in present-day Liaoning Province, China. The city was of great strategic importance as the major Russian military center for southern Manchuria, and a major population center on the main line on the South Manchurian Railway connecting Port Arthur with Mukden. The city was fortified by the Imperial Russian Army with three lines of fortifications. Paul Georg Edler von Rennenkampff, more commonly known as Paul von Rennenkampf in English, was a Baltic German nobleman, statesman and general of the Imperial Russian Army who commanded the 1st Army in the Invasion of East Prussia during the initial stage of the Eastern front of World War I. He also served as the last commander of the Vilna Military District. The Battle of Shaho was the second large-scale land battle of the Russo-Japanese War fought along a 37-mile (60 km) front centered at the Shaho River along the Mukden–Port Arthur spur of the China Far East Railway north of Liaoyang, Manchuria. The Battle of Sandepu was a major land battle of the Russo-Japanese War. It was fought within a group of villages about 36 miles (58 km) southwest of Mukden, Manchuria. The Siege of Port Arthur, the deep-water port and Russian naval base at the tip of the Liaodong Peninsula in Manchuria, was the longest and most violent land battle of the Russo-Japanese War. The Battle of Te-li-ssu, also called Battle of Wafangou after the nearby railway station, was a land battle of the Russo-Japanese War. It was fought at a hamlet some 80 mi (130 km) north of Port Arthur, Manchuria. The hamlet is known today as Delisi, and is located just north of Wafangdian, Liaoning Province, China. It was fought on 14–15 June 1904 between the Japanese Second Army under General Oku Yasukata and the Russian First Siberian Army Corps under Lieutenant General Georgii Stackelberg. The Battle of Gumbinnen, initiated by forces of the German Empire on 20 August 1914, was a German offensive on the Eastern Front during the First World War. Because of the hastiness of the German attack, the Russian Army emerged victorious. Nikolai Petrovich Linevich, also Lenevich and Linevitch was a career military officer, General of Infantry (1903) and Adjutant general in the Imperial Russian Army in the Far East during the latter part of the Russo-Japanese War. 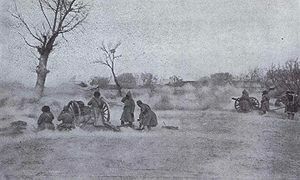 The Battle of Tashihchiao was a land engagement fought on 24–25 July 1904, during the Imperial Japanese Army's advance toward Liaoyang in first stage of the Russo-Japanese War. Tashihchiao is located about 25 kilometres (16 mi) southwest of the city of Haicheng, in present-day Liaoning Province, China. The town of Tashihchiao was of strategic importance in the Russo-Japanese War, as it was a railroad junction between the main line on the South Manchurian Railway and a spur which led to the old treaty port of Yingkou (Newchwang). Control of both was essential for further advances by Japanese forces towards Liaoyang and Mukden. 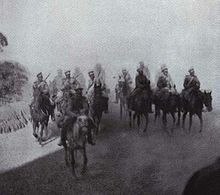 The Battle of Motien Pass was a minor land battle of the Russo-Japanese War, fought between the Imperial Japanese Army under General Kuroki Tamemoto and the Imperial Russian Army under General Count Fedor Keller over control of a strategic mountain pass on the main road between the coast and Liaoyang, Manchuria on 10 July 1904. The Jiangqiao Campaign was a series of battles and skirmishes occurring after the Mukden Incident, during the invasion of Manchuria by the Imperial Japanese Army, prior to the Second Sino-Japanese War. Baron Ijichi Kōsuke was a general in the Imperial Japanese Army in the First Sino-Japanese War and Chief of Staff of the Japanese Third Army during the Siege of Port Arthur in the Russo-Japanese War. His wife was the niece of Marshal Oyama Iwao. Mikhail Ivanovich Zasulich was a general in the Imperial Russian Army, noted for his role as commander of the Russian 2nd Siberian Army Corps in the Battle of the Yalu River, of the Russo-Japanese War of 1904–1905. Nikolai Platonovich Zarubaev was a Imperial Russian general in the Imperial Russian Army in Manchuria during the Russo-Japanese War. Baron Alexander Alexandrovich Bilderling was a Russian general of Baltic German descent, noted for his role in the Russo-Japanese War and as an artist and monument designer. The 2nd Manchurian Army was a field army of the Russian Empire that was established in 1904 during the Russo-Japanese War, to operate in Manchuria against Japan. It was one of the three such armies that were created and was disbanded in September 1905 after the end of the War. The 3rd Manchurian Army was a field army of the Russian Empire that was established in 1904 during the Russo-Japanese War, to operate in Manchuria against Japan. It was one of the three such armies that were created and was disbanded in February 1906.